This is a Die set for 6.5-300 WBY Magnum .264. 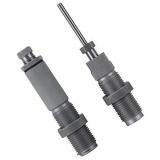 Hornady reloading dies represent fine machined craftsmanship. Articulated details offer more precise reloading, by offering easier adjustments, better alignment and smoother functioning. With one of the finer internal finishes in the industry, Hornady Custom Grade and Match Grade Dies provide a lifetime of reloading. They're so well crafted that they're guaranteed never to break or wear out from normal use.